DAVIS, CA The consumer market for probiotic ingredients is over $40 billion and rising, but clinical research into its efficacy has been sparse and diffuse. 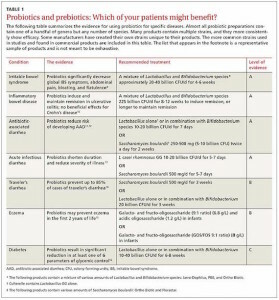 A new study released by the Journal of Family Practice has translated existing research on health benefits of probiotics into specific recommendations for family physicians, and proven that certain probiotics have a demonstrated impact on the use of probiotics in the management of irritable bowel syndrome, inflammatory bowel disease, ulcerative colitis and several types of diarrhea. , Tara Master-Hunter, MD, Amy Locke, MD, FAAFP Department of Family Medicine, University of Michigan, Ann Arbor (Drs. Schneiderhan and Master-Hunter); Department of Family and Preventive Medicine, University of Utah, Salt Lake City (Dr. Locke) graded the available evidence for probiotics or prebiotics in the management of irritable bowel syndrome, inflammatory bowel disease, antibiotic associated diarrhea, acute infectious diarrhea, traveler’s diarrhea, eczema, and diabetes. The study found that probiotics containing Lactobacillus and Saccharomyces separately or in combination are most effective in the treatment of a variety of different diarrheal conditions, while combination probiotics can significantly decrease global IBS symptoms such as abdominal pain, bloating, and flatulence. Th usprobiotics.org website, funding by CDRF, highlighted this study in a recent blog post. As the gut flora contribute 99% of the genetic material in the human body, the impact of colonizing microbes in the human body are known to have an important role in health. Probiotics are one means of influencing the functions of our microbiome. 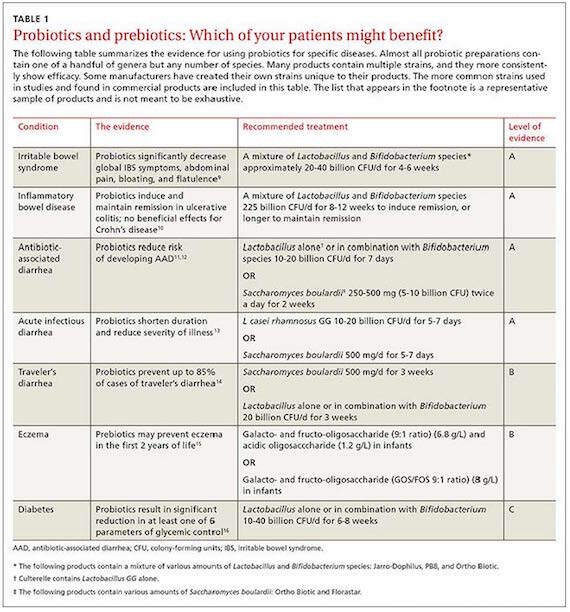 Research on probiotics is ongoing on a wide range of health and disease endpoints. Promising early results suggest they may be useful for the management of metabolic disorders, obesity, diabetes, psychiatric conditions, eczema and rheumatoid arthritis, but it is still too early for clinical recommendations. This information is provided by the California Dairy Research Foundation to service its members and the California Dairy Industry. No funding was provided by CDRF for the conduction of this study.